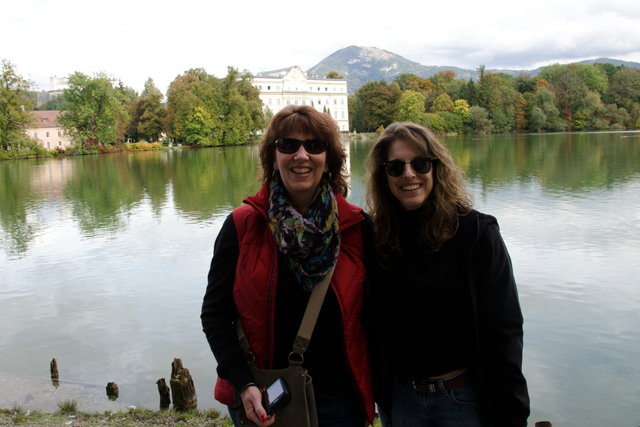 The impetus for this entire trip was to knock a Sound of Music tour off Laurie’s bucket list and today was the day. We first headed out to Berchtesgaden for a tour of a salt mine. Laurie wasn’t entirely happy 1800′ under ground, but we all a good time. We also all agreed that it was a bit spooky being led by a blonde, blue-eyed, whistling youth in full uniform through door that he locked behind us, while we were all wearing company-issued jumpsuits. The train ride that took us partway down would never have existing in the United States. We were moving at a substantial clip with no seatbelts, protective rails, roofs, walls or anything through tunnels where the walls and roof were about one foot away from you. Stick out your hand and you’d lose it. After lunch, we went on the Sound of Music tour. It was a hoot! Somehow, Nadia got the whole bus singing. Perhaps it was the fact that she had the bus continue to loop around a traffic circle until we did. Perhaps it was the beer at lunch. The apple strudel in Mondsee was the best of the entire trip. This entry was posted in A Leak and a Liter, Austria, Germany. Bookmark the permalink.